One of Nelson Ronsheim’s earliest photographs captures in exquisite detail the construction of the Columbia Parkway Viaduct running from Mt. Adams into downtown. Jagged girders surge across the frame, soon to be encased in the Herculean curvature of WPA concrete. According to Ronsheim’s grandson, Michael G. Smith, that shot set the stage for some 800 subsequent black-and-white compositions of exacting shutter-work. 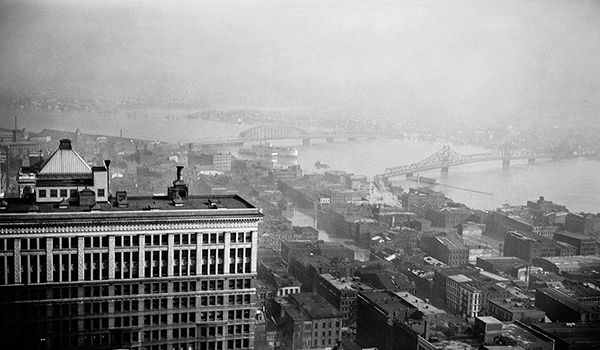 Throughout the 1930s, Ronsheim documented Cincinnati as it went through a period of dramatic physical upheaval. But perhaps we’re getting ahead of ourselves. Perhaps you’re still scratching your head and thinking “Nelson who?” If you’ve never heard of Nelson Ronsheim, well, you’re not alone. He has a long-standing reputation among regional history buffs, albeit one that has waxed and waned, but beyond that crowd few people know of him. 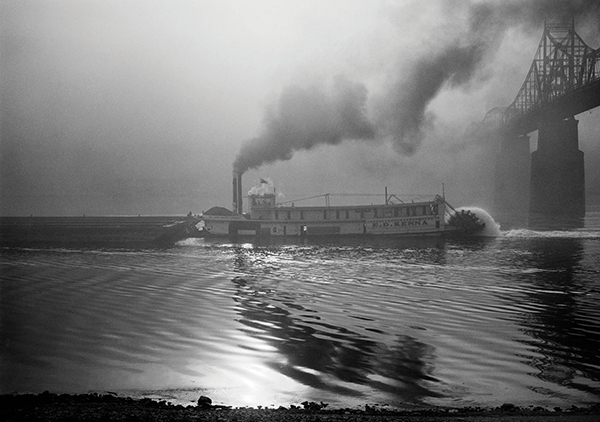 Like O. Winston Link, another artist whose work wasn’t “discovered” until well after the photographs had been shot, Ronsheim spent years focused on a subject that fascinated him. 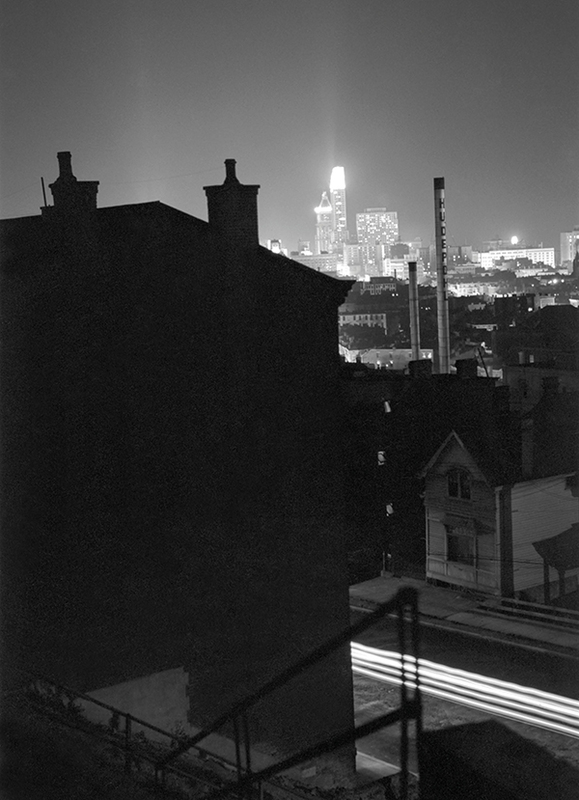 For Link it was locomotives (often photographed at night); with Ronsheim it was the changing urban and industrial face of Cincinnati during its most transformative years. Now his work is finally coming out of the shadows. 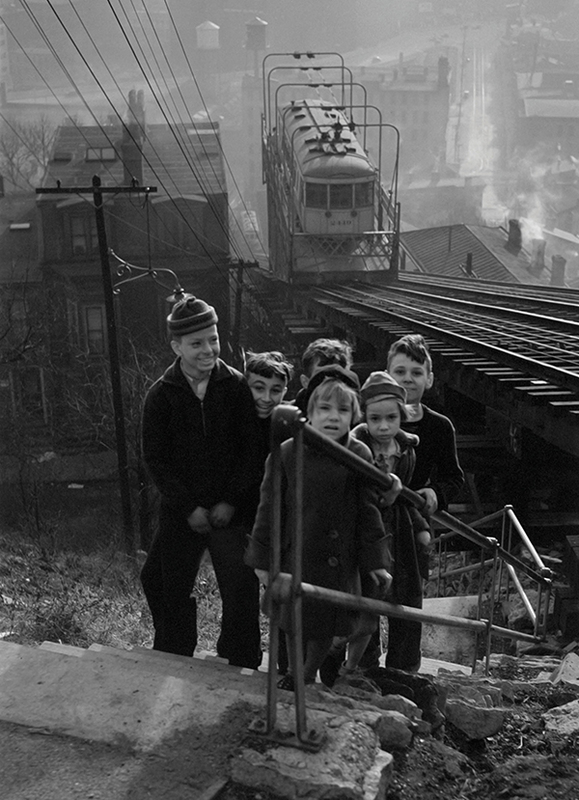 Chris Smith, an amateur photographer and a genealogy and local history librarian at the Public Library of Cincinnati and Hamilton County’s main branch, is on a constant quest for obscure images of Cincinnati. About four years ago he stumbled across examples of Ronsheim’s work on the web. Intrigued, he did some sleuthing and discovered Michael G. Smith’s Flickr page. Michael had inherited the complete collection of his grandfather’s photographs: 641 black and white negatives taken between 1937 and 1942, as well as some prints and roughly 13,000 Kodachrome and Ektachrome color slides. It was a perfect moment of World Wide Webulous serendipity made almost too perfect by the fact that Chris also oversees a photo-centric website with Alex Bell, another Queen City-based photographer. The site—called A Glimpse From the Past—covers many eras, but rarely does it tap a vein this rich. In short order, Chris struck up a correspondence with Michael G. Smith (no relation), and after some negotiating and a meeting over chicken and waffles at Taste of Belgium in 2012, Michael agreed to provide a selection of high resolution scans for the two photo historians to promote and sell on their site. Born in 1905 in the West End, Ronsheim’s training began at the Art Academy when he was just 14. He worked as a commercial artist and illustrator for C.H. Schaten Studio, which many years later would morph into the brand design firm LPK. When he was 23, Ronsheim set out on his own as a professional artist and illustrator, supporting himself and his family from 1928 until his retirement in 1970 doing work in many guises. 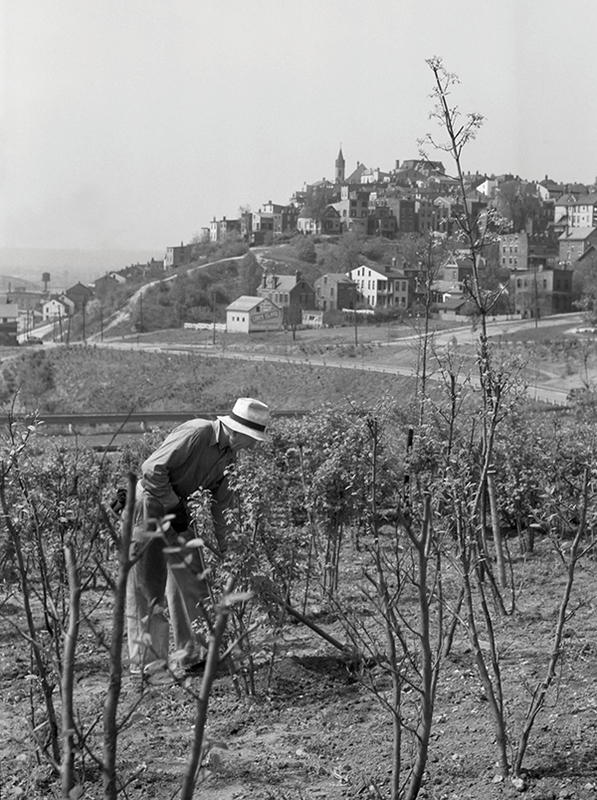 Ronsheim worked with a folding Voigtlander Avus 9 x 12 centimeter camera, the kind with an expandable bellows mounted on a tripod, and sometimes with an early roll film camera. 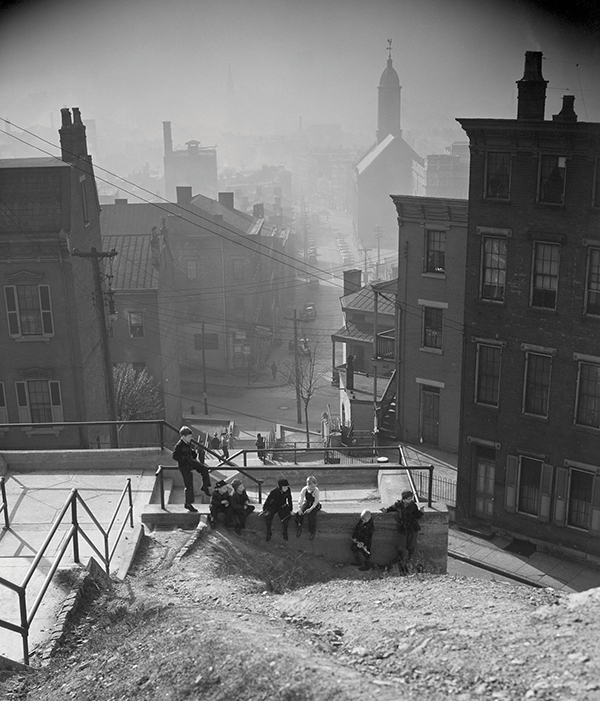 These he lugged up the city’s steps and inclines to capture vistas dense with people and industry. It took immense skill and intuitive adjustments, Alex Bell notes, because the results wouldn’t become visible until he got in the darkroom. And all the while he surely must have been aware of the transitory nature of his subject. 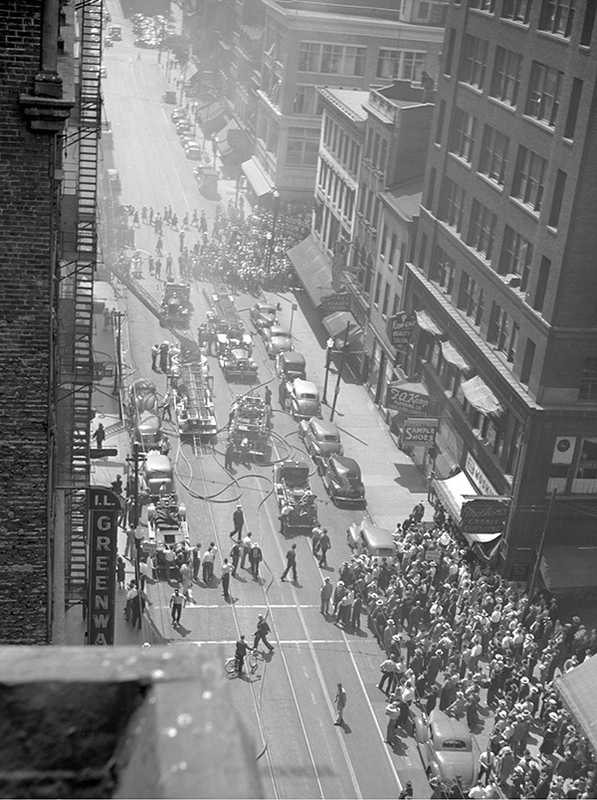 As a boy he’d seen Cincinnati’s German speech go from lingua franca to lingua non grata; now he watched the Carew Tower rise and old parts of town fall, as massive public works projects rearranged the surrounding valleys and hillsides. If World War II hadn’t put the pinch on his photo supplies, there’s no telling how much more of the Queen City’s transformation he would have etched in glorious black and white. Still, he continued to shoot the city, primarily in color, until his death in 1980. “Every picture is another piece of the puzzle of getting into my head what the city was like in 1930 or ’40—the close-knit [nature] of everything, the buildings clinging to the sides of the hills,” Chris Smith says. For him, Ronsheim’s genius lies in his fusion of the big picture with the intimate, transporting the viewer through time.